1. Velma met my sister! She and Eric had their kettle corn stand at a Naples farmer’s market which was less than a mile from my sister’s house. So I sent her over to surprise them. Read all about it here. 2. Gwen’s dance card is filling up with social engagements! She will attend the prom at her boyfriend’s school in April and be a flower girl in a wedding this summer. I had assumed that Gwen’s handicaps would keep her from activities such as these. Sometimes it’s good be wrong. 3. The Winter Quilt Swap deadline is fast approaching and I’m speeding toward the finish line. Can’t show anything yet, but here are some of the fabrics. 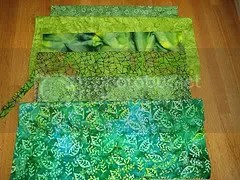 Green fabrics for a winter quilt? Stay tuned- it will make sense later. This entry was posted on January 29, 2008 at 6:54 pm and is filed under Uncategorized. You can follow any responses to this entry through the RSS 2.0 feed. You can leave a response, or trackback from your own site.